Enjoy the open concept in this beautifully furnished, end unit condo. Kitchen includes custom cabinetry, stainless appliances including refrigerator, dishwasher, microwave and oven, and large island with seating for up to six. The kitchen is open to the living room which features a wonderful gas fireplace and is perfect for entertaining. The first floor also features a one car garage, a half bath, and sliding glass doors to private deck overlooking a tranquil common space. The second floor features a laundry room equipped with a washer and dryer. Master bedroom has a king size bed, walk-in closet and bathroom featuring a large walk-in shower. In addition, there's a second bedroom with a queen size bed and a guest bathroom. 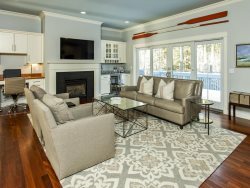 Located in the Northgate area of Portland, this condo has convenient access to Portland, Westbrook, and Falmouth, as well as I95 and I295.